The Hyundai College Football Sweepstakes is open only to legal residents of the forty-eight (48) contiguous United States and the District of Columbia who are at least 18 years of age or the age of majority in their states of residence, whichever is older, and have valid U.S. driver’s licenses. 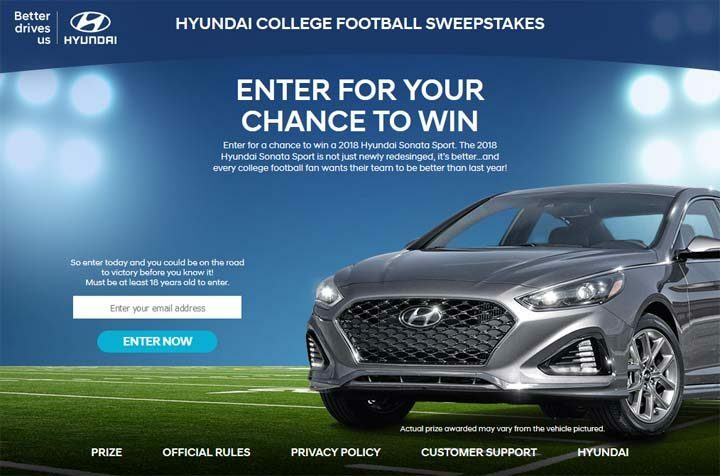 The Hyundai College Football Sweepstakes ends on November 25 at 11:59:59 PM ET. During the period, go to hyundaicollegefootballsweepstakes.com and enter your valid e-mail address to access the online registration. After, complete and submit the online entry form as directed. Limit one (1) entry per person/email address per calendar day.